This is, unfortunately, a very short post. It's really nothing more than a long photo caption for a haunting photo of my Great Grand Aunt Emily Justina Browne (Silmser), newly married, and shortly before her death at the age of 21. (I remember my grandmother, Hazel Browne (Curtis) telling me that the photo was taken shortly before Emily's death). Emily was born March 28, 1867 to Jacob Elias Browne and Sarah Sibley Sanderson Browne in the tiny hamlet of Osnabruck Centre, Stormont County, Ontario, Canada; a Loyalist conclave in Upper Canada. She was the younger sister of my great grandfather, George McLelland Browne. From the bits and pieces I can gather on the genealogy sites online, Emily lived her entire life in Upper Canada. At the age of 19, Emily, "a Spinster" as the records indicate, married a man who was boarding with them, John Jacob Silmser, "a Widower". John was 25 years old, and in an ironic twist, is the half 2nd cousin 1x removed of my husband. John's mother was a Beckstead, granddaughter of Francis Beckstead, who was my husband's great great grandfather. Unlike my Emily, much history is written of the Beckstead clan. Emily and John were married September 1, 1886 in Woodlands, Frontenac, Ontario, Canada. 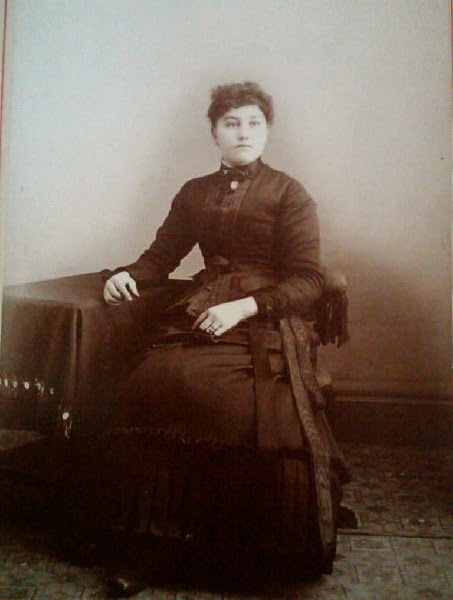 At some point not long before her death, it appears that Emily must have visited her brother, George, in Minnesota where he worked as a railroad agent, since the photo below was taken at the H.J. Chalmers Studio in Madison, Minnesota. Emily died August 10, 1888 in the town she had spent her life in, Osnabruck Centre, Stormont, Ontario, Canada at the age of 21, still a newlywed, not yet married two years. There is a hint that there was a child, as some family trees online indicate a child marked "Private" and female. Does this mean that they had a daughter, who died at birth or in infancy? And did Emily die in childbirth? Both of these are highly possible I suppose, but I don't know the answers. taken not long before her death.